This bridge would terrify my mother if she saw me on it. I’m looking down past my feet and through the slats of an 18-inch-wide grated deck – the only thing between me and the 400-foot chasm directly below. But, boy, do I feel exhilarated. This 238-foot-long custom-made steel suspension bridge debuted last year, the latest addition to a quartet of via ferrata climbing routes at Utah’s Amangiri resort. An Italian term for “iron road,” via ferrata refers to a system of permanent climbing holds, short ladders, and bridges bolted into rock faces, linked by a series of steel cables for safety. Long popular in the European Alps as a way for hikers to ascend steeper peaks, guided via ferrata courses have started popping up around North America, including Colorado, Utah, West Virginia, Quebec, and British Columbia. On the courses, hikers experience the rewards of scaling a cliff – the unique vantage points, the stone’s tactile appeal, the physical exertion – without having to know how to rock climb. My husband and I discovered via ferrata’s appeal a few years ago in Canada. I know how to rock climb but rarely do it anymore, so my skills are admittedly rusty; my husband has never been a rock climber. Yet we both loved the via ferrata experience. When I learned that the Amangiri, a resort that already intrigued me for its desert-inspired modern architecture and reputation for Zen-like luxury, offered a similar opportunity, I jumped at the chance to check it out. The suspension bridge walk culminates my exploration of Amangiri’s via ferrata, all of them constructed on the resort’s 600 acres of prime desert terrain. Earlier on that agreeably mild October day, two amiable and fit guides from Adventure Partners, the hotel’s on-site guiding service, outfit me with a traditional rock-climbing harness, a helmet, and low-cut hiking shoes with sticky rubber soles. Before we begin our ascent of the Red Line via ferrata, which runs more than 400 feet to the top of Studhorse Mesa, guide Christian Seamans shows photographer Tom Brownold and me how to use the Iron Cruiser, a device attached to our harnesses that will link us to the stainless-steel aircraft cable bordering the route. The cruiser has two carabiners connected by extendable lanyards designed to absorb energy – and lessen impact – in the unlikely case of a fall. Both carabiners stay clipped into the low-slung cable and slide along, except when you come to one of the frequent anchor bolts. Then you detach one ‘biner, reattach it past the anchor, and follow suit with the second. “Clip past the anchor points when you’re at eye level with them,” Christian advises. Would the bolts ever pop out, I wonder? Unlikely, Christian assures me, noting that burly 1/2-inch diameter bolts hold the various elements in place. We start by climbing a dozen narrow rungs bolted into near-vertical rock. On the next, lower-angle part of the route, we can scramble up on hands and feet. “We used the natural rock as much as we could,” says Christian, explaining how he and Mike Friedman, also of Adventure Partners, designed this route, the Amangiri’s newest and longest. The rock feels chalky and slightly textured as I grasp the various handholds. Wind- and water-sculpted, striated in hues of red and beige, it’s nature’s art. We fall into a pleasant rhythm with the cruisers: unclick, click, unclick, click, slide. Unclick, click, unclick, click, slide. I find a visceral satisfaction in placing one foot on a protruding bit of rock or perhaps a ledge, reaching up with a hand, and moving upward, like snapping together two pieces or fitting a key into a lock. As I breathe in the soothing sage scent of the desert, my whole being relaxes, despite the fact that I’m a couple of hundred feet up a rock face. The very air seems quiet. Soon we’re at the Nose, a large protuberance that includes a somewhat tricky overhanging section. As we ascend another series of bolted rungs, we also climb past the namesake red line itself: a “compressed” layer of iron that streaks across the entire mesa. Indeed, the Amangiri via ferrata experience includes a mini-geology lesson. We have been working our way up Entrada sandstone, a layer of rock formed 160 to 165 million years ago, explains Christian. At the mesa’s top, we will be on Dakota sandstone, a younger layer at 100 million years old. When we do top out, stunning scenes in all directions reward us. To the north lie the mesas of Grand Staircase-Escalante National Monument; to the east, Lake Powell’s southern reaches, perfectly placid today; and rising prominently on the horizon, the Navajo Mountain, on the Arizona-Utah border. Amangiri’s low-slung, concrete buildings below almost fade into the surrounding landscape. 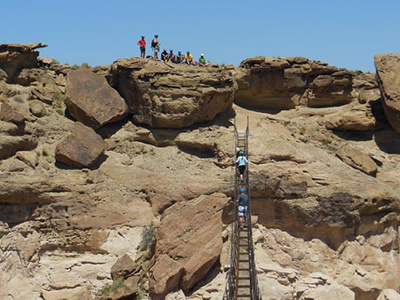 Rather than reverse our route back down Red Line, we hike a few minutes across the mesa and descend via the Studhorse Mesa via ferrata,the first one built just before Amangiri opened in 2009 and a shorter route that includes more straightforward hiking. Still, occasionally, he admits, “I’ve had guests start out and say no way in hell. And then we go to plan B.” That plan could include hiking one of the on-property trails; visiting Broken Arrow Cave, an archaeological site near the hotel; or making an off-resort excursion to a nearby national park (Bryce Canyon, Zion, or the Grand Canyon) or wilderness area. Guests typically tackle one via ferrata per day, allowing three or four hours for the experience. But since I’m eager to try all four during a short stay, we beeline it over to the Cave Peak via ferrata on the valley’s other side. An initial 32 rungs on an exposed, starkly vertical rock face enable us to climb the first 100 or so feet. From there, the route twists and turns, taking us up a slot and over water-eroded spillovers in the rock. The crux is a 100-foot-long traverse across the rock – with no rungs, only the cable as an aid. Christian advises us to keep the cable between chest and waist height and lean back a bit, a counterintuitive move, to be sure, but one that helps us negotiate the small natural footholds below. We later pause for a short rest on the top of Cave Peak, then retrace our steps back down. After a poolside lunch of tuna tartare at the resort’s restaurant, we have only the Hoodoo via ferrata left to tackle, which we approach by hiking through a large notch in the rock. We first climb a chimneylike formation to a small alcove, then follow a sinuous path up through the rock, topping out a short walk from the new suspension bridge, an optional, but highly recommended side trip. On the way back down, I’m captivated by the mushroom-cap rocks on the sandstone pillars clustered in this area. By the time we reach bottom, the sky glows rosy apricot. The desert is quiet and soft. I’m beginning to feel the exertion of climbing reverberate through my quadriceps, and I plan a pre-dinner swim in the hotel’s large free-form pool and contemplate booking a Thai massage at the spa tomorrow. But in the meantime, I’m looking forward to lounging on the day bed on my room’s patio while listening to the evening’s musical hum of frogs and crickets. More so than any other hotel I’ve been to, the Amangiri seamlessly integrates with the environment, so that even in my room, with its floor-to-ceiling glass patio doors, sandstone floors, and even a sandstone bed and couch surround, I feel at one with the desert. Not energized, like on the via ferrata, but deeply, deeply at peace.